It takes a certain kind of confidence to get yelled at by one of the world’s greatest chefs and come away feeling the better for it. When Chef Drew Terp recalls the first time acclaimed restaurateur and chef José Andrés yelled at him, he does so with fond laughter. I had asked Terp what it was like to work under the tutelage and often scrutinizing eye of a man revered in the food world as a groundbreaking genius, a frequent Top Chef judge, and a man who is not afraid to go toe to toe with no less than President Donald J. Trump on Twitter. Pico’s menu features a strong commitment to farm-to-table dining, with items locally sourced. Dishes at the Los Alamos eatery, such as seared duck breast, reflect Chef Drew Terp’s love of comfort food with understated elegance. Apparently Terp, seeking to stem product waste in the kitchen at Andrés’ Jaleo, had noticed a stew was being disproportionately served. Andres was furious, because in the effort to conserve product, Terp had overlooked the sacrifice the portioning had caused to the flavor of the final meal. It was a lesson Terp seems to have carried to heart all these years later. The care and love a chef gives to a particular dish should never be sacrificed for a few pennies in a ledger column. Diners at Pico Restaurant (who’ve called his menu “off the hook” and more in online reviews) appreciate the distinction. Long before he was getting an earful from Andrés, Terp was just a kid with a love affair with food. That love steered him toward a career in the food industry, working his way up from server to chef. He scored a series of gigs as he moved, but it was while working at Chef Masayoshi Takayama’s Masa restaurant (which holds three Michelin stars) where he came face to face with the realities of working in a high-pressure kitchen of a world renowned chef. Chef Drew Terp of Pico Restaurant in Los Alamos said he’s had a love affair with food for his entire life. “I just love to eat, and I love food,” he said. Terp said he embraced the experienced and pushed himself, learning as much as he could about sourcing, plating, and all the finer details of running a restaurant. So what brought a chef who’s worked in some of the biggest restaurants in New York and Las Vegas to Los Alamos? A love for the region’s strong sustainability/farm-to-table roots were a draw. Working in a smaller region also allows a chef to play a dynamic role in shaping the conservation of the food landscape, which is what Terp has been helping do since he joined Pico in Los Alamos when they opened in 2016. In February the restaurant celebrated its first year, and it has recently expanded to offer an outdoor seating area. Highlights at Pico now include a free corkage on Thursdays, “Blind Fridays,” offering four wines for $10, live music two nights a week, and a burger night on Sundays. Terp calls his food “upscale comfort food,” and with menu items such as grilled cornbread with ribeye and pork belly with grilled peaches, it’s clear that he’s nailing the concept. 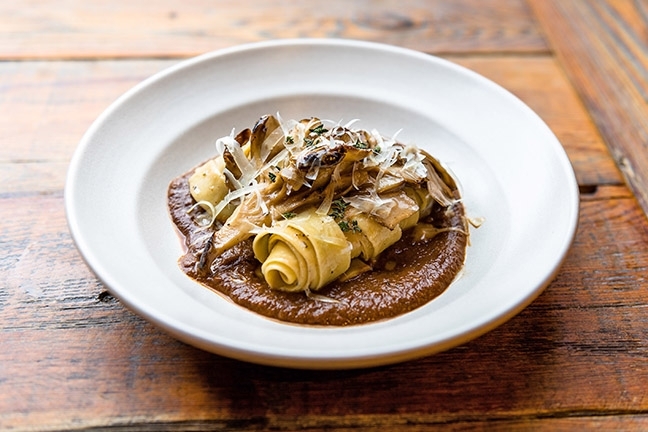 To kick-off a series of upcoming cooking classes taught at Pico, Chef Drew Terp plans to start by teaching the basics of making fresh pasta, a skill he said helped him evolve as a chef. One of his real passions is charcuterie, which may surprise people about a chef known for his cooking. But the philosophy behind slow-aged meats isn’t that far from slow-cooked meats, focusing on time and patience to bring out the best elements. One of those things is short ribs, a meat that needs a long, slow braise to fully develop flavors. When I asked if Terp had any tips for home cooks (such as myself) who love preparing the succulent dish, he offered some life-changing advice. Another secret is understanding when and how to properly develop a braising liquid. Terp said one easy thing to do to immediately step up the quality of a braise is to monitor the time herbs and spices cook. 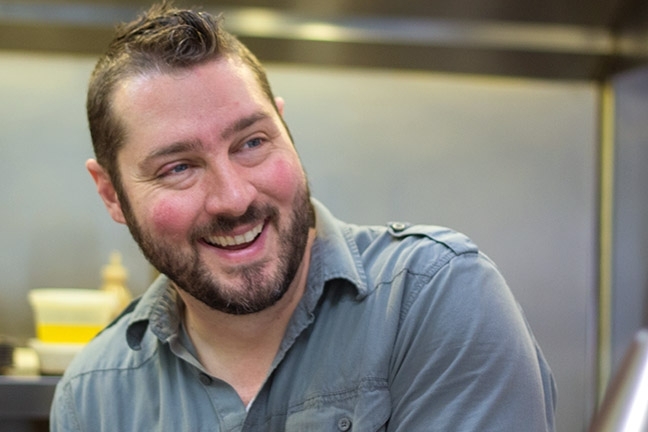 Chef Drew Terp’s cooking classes at Pico Restaurant start Aug. 19. For more information, call 344-1122. Pico is located at 458 Bell St., Los Alamos. Try reducing red wine with herbs and spices and then straining the reduction before adding it to your braise, Terp said. The impromptu cooking lesson is just a small part of Terp’s desire to share his knowledge with others. He said that rather than hand out a recipe card, he’d prefer to invite a curious diner into his kitchen to learn firsthand and teach techniques rather than steps in a recipe. It’s this interest that prompted him to start a series of cooking classes at the restaurant. Terp plans to teach a course on a cooking staple, such as smoking, emulsions, sauces, or charcuterie about once a month. One of the first things he wants to start with is pasta. Ultimately, Terp doesn’t seem to miss the big city lights as he carves out a reputation on the Central Coast. Please do not yell at Rebecca Rose. Contact her at rrose@santamariasun.com. Chocolate and mascarpone ice cream with caramelized bananas at SY Kitchen in Santa Ynez. • Have I ever adequately explained how I’m a total soup nut? I think it’s just a perfect meal, and it’s a wonderful way for chefs to showcase so much of their talent and skill in one compact bite. The amazing Chef Brooke Stockwell at K’Syrah Catering has a butternut squash soup with pine nuts, truffle oil, and fresh basil which looks divine. The caterer and event hall is located at 478 4th Place, Solvang. 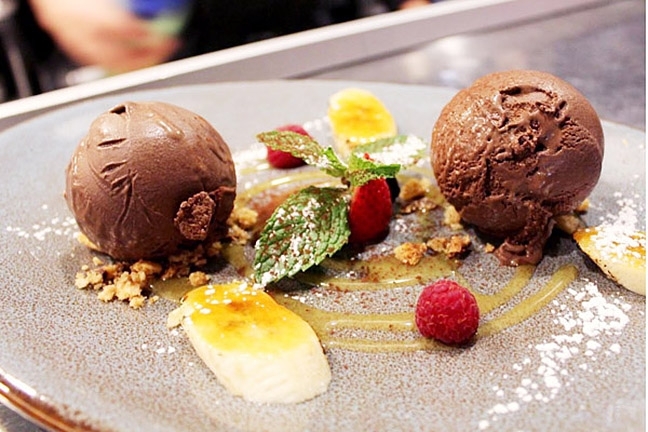 • SY Kitchen’s chocolate and mascarpone ice cream (pictured) with caramelized bananas is absolutely ridiculous and delicious and you will love it like a newborn baby. Try it with one of Alberto Battaglini’s signature cocktails or one of their dessert wines at 1110 Faraday St., Santa Ynez. • Good news, wine lovers! Santa Maria’s wine trolley is extending service through Oct. 1. Tickets are $10 in advance or $18 at the trolley itself. Tickets can be purchased at participating wineries or at Santa Maria Valley Chamber of Commerce Visitor and Convention Bureau, 614 S. Broadway, Santa Maria.